The 24 Horses are finalized. Barrier draw is done jockeys picked All that needs to be done now is to get “The Pubs” 2016 Melbourne cup sweep going. The first 24 people to ask for a ticket will go into the draw which I will conduct after all places are filled. Entry is free and first prize will be a $50 BWS voucher or similar from your local bottle shop. A form guide is below the sweep if you wish to check out your horses chances and Last years race is there if you wish to watch Michelle Payne win on Prince of Penzance. COMMENT: Comes into the race in good form winning 2 x G2 in England. Led and stuck on very well in Melb Cup last year finishing 5th. Will make own luck and stable are confident of a big run. Winning chance. COMMENT: Has been going through his gears leading into race. Big run in the Caulf Cup last start suggesting 3200m will be perfect for him. Unlucky runner in Melb Cup last year and has similar conditions this year. Barrier is kind and will get a good run. Big chance. Good e/w odds. COMMENT: Comes into the race out of form and 9YO so improvement is unlikely. The only plus is he will make his own luck on speed and Japanese horses have always gone well in our big races but his track work/form says he can’t win. Others better. COMMENT: Lightly raced consistent stayer with plenty of upside. Comes into race on the back of two good runs in Irish G3’s with the step up to 3200m to suit. Luckless in last years Melb Cup where he hit the line well when he got room. Looks a big chance. COMMENT: Ran a good third in Caulf Cup last start where he stuck on well. Based on Caulf Cup run the 3200m looks a concern and other Internationals come in with better form. Happy to leave out. COMMENT: Devastating win in the G1 Turnbull before a distant 2nd to Winx in Cox Plate. Deserving favourite based on Turnbull win and has a lot of class but the 3200m is a query after finishing 15th in Melb Cup last year, despite being unlucky he didn’t hit the line with too much authority. Big chance but better value elsewhere. COMMENT: Looked the winner in the MV Cup before being run down. Ticking along nicely and gets the 3200m. 4th in Melb Cup last year so has to be respected. Place chance. COMMENT: Last start G1 Irish St Leger winner who has won 6 times over 3200m. Strong gallant stayer who will run a big race but will need some luck from outside barrier. Guaranteed to get the trip and will give a good site. Good e/w bet. COMMENT: Has to be respected on his Caulf Cup run when he hit the line well late. If he can get a good run from the wide barrier he has the turn of foot to win but can be a hit or miss horse. Place chance. COMMENT: Good run in the Naturalism behind Jameka two starts ago before a very disappointing run in MV Cup. Won this years Sydney Cup over 3200m which is a plus but on his last start its hard to have him. Take on trust. COMMENT: Didn’t look to be going too well until a good MV Cup win. Has won Sydney Cup over 3200m so he will stay the distance but will need rain to be a winning chance. Place chance at best. Comes right into the race if he gets a wet track though. COMMENT: Impressive Caulf Cup winner. 3200m looks ideal despite breeding saying otherwise. Has had a few small set backs and her odds are on the drift but on her Caulf Cup win she looks hard to beat. Good winning chance. COMMENT: Huge win in the Ebor Handicap last start and before that another good win in the Galway Hurdle. Comes into the race in very good form and he will definitely get the distance. Has a good turn of foot for an out and out stayer but will need luck from barrier. Big winning chance. COMMENT: Good win in the G1 Metrop before disappointing run in Caulf Cup. Untried at the distance which is a concern and hard to have him on last run. Unlikely to figure. COMMENT: Ticking a long okay this prep. Looked the winner in last years Melb Cup at big odds before finishing 7th but was going better this time last year. Place chance at best. COMMENT: Stuck on well in the listed Nayef Stakes in GB last start running 3rd. First up in Melb Cup and other Internationals look better but gets inside barrier and will get an easy run but will need a lot to go his way to win. Happy to leave out. COMMENT: Lightly raced stayer. Awesome/easy win last start in G3 at Flem over 2500m when eased down. Gets into the Melb Cup low in the weights and has been set for the race. With luck from barrier he looks very hard to beat. Our top pick. Very good e/w bet. COMMENT: Won a weak Herbert Power last start but race has been a good form line for Melb Cup’s. Drawn poorly and looks to be 3rd best from stable in the race. Will need a lot to go right for him to figure. Place chance at best. COMMENT: Was gallant running 2nd in Geelong Cup last start where he had a better run than Qewy and was still beaten. Before that he didn’t look to stay 3000m in France G2 so distance is big query. Prefer others. COMMENT: Scintillating win in Lexus Stakes and looks like he will relish 3200m. Godolphin did everything to get him into field which says a lot. Has to race 3 times in 2 weeks but if he backs up he looks hard to hold out. Big chance. COMMENT: Good win/place record in questionable form races but looks like he will get the distance. Has only raced twice in 12 months which is a concern but with light weight and a decent turn of foot he could surprise. Place chance. COMMENT: Nothing in his form says he is good enough to win this race. Well beaten in Lexus Stakes last start where he dropped out of race. Can’t see him in the finish and odds support that. COMMENT: All the way winner in Geelong Cup holding off rivals. Will run on the speed and make his own luck and has placed 3 times over distance in 3 starts. Rock hard fit stayer who looks over the odds. Good e/w chance. COMMENT: Rank outsider of the field and deservingly so. There is nothing to suggest she can go close in this race. Can’t win. The Boss has just let me know he can’t do the Friday thread. I am sure it’s not because he’s just received a prior invitation . . . Anyway, this will be short and sweet from moi, but please enjoy the musical entertainment. Today we have seen – to this regime’s eternal shame – the bastardisation of the separation of powers, with cane toad’s ouster of a most honourable person, Justin Gleeson SG, QC etc. It becomes even more imperative to watch their every move on the Human Rights Commissioner, Dr Gillian Triggs. Thanks as always to Dr Jennifer Wilson of No Place for Sheep for her take on this appalling situation. It’s hardly President of the Human Rights Commission Gillian Triggs’ fault when the Australian government is the worst human rights offender that Commission has to deal with. When a government acts criminally, one hope for recourse is that statutory bodies will refuse to collude with or enable that government’s criminal behaviour, and indeed, that such bodies will name and shame the errant government. The Turnbull government’s accusation that Professor Triggs is “politicising” her role is, like much of this government’s spin, farcical. For a start human rights are inherently political, and secondly all actions by governments are also inherently political. If the Turnbull government is determined to transgress the human rights of refugees currently abandoned to a highly uncertain future on Manus Island and Nauru, Professor Triggs has no option but to hold it accountable, otherwise she isn’t doing her job. Of course any commentary Triggs runs on the government of the day is necessarily political, favourable or otherwise. There are instances in which even the silence of someone in her position is political. Is it the government’s expectation that Triggs will ignore human rights abuses because they are perpetrated by the government? In what country are we living? Triggs isn’t acting in isolation. Amnesty, the UNHCR, professionals who’ve worked on Manus and Nauru, refugee advocates, some thirty nation states, and this editorial in the New York Times speak with one voice to Australia’s refugee detention policies, and that one voice is damning. There’s no doubt that in some instances, including the New York Times editorial, there’s blatant examples of the pot/kettle affliction, however, that does not invalidate the truth of the protests against Australia’s policies. In a classic abuser pattern of behaviour, the Turnbull government continues its efforts to destroy the messenger, in this case Professor Triggs, though the government isn’t fussy, the tactic is transferable. The first concern of abusers is to silence accusers, and the government has displayed this pathology innumerable times, not only in relation to the secrecy with which it surrounds Manus and Nauru and threats of retribution, including imprisonment, against anyone who might transgress those secrecy demands. Last week, the Border Force Act was amended to remove a comprehensive list of health professionals from the threat of two years jail for speaking publicly about conditions they encountered whilst working in the detention camps. The Turnbull government was forced to make this particular backflip because health professionals have spoken out regardless of the intimidation, and even this collection of political grotesques can see the folly of prosecuting them. 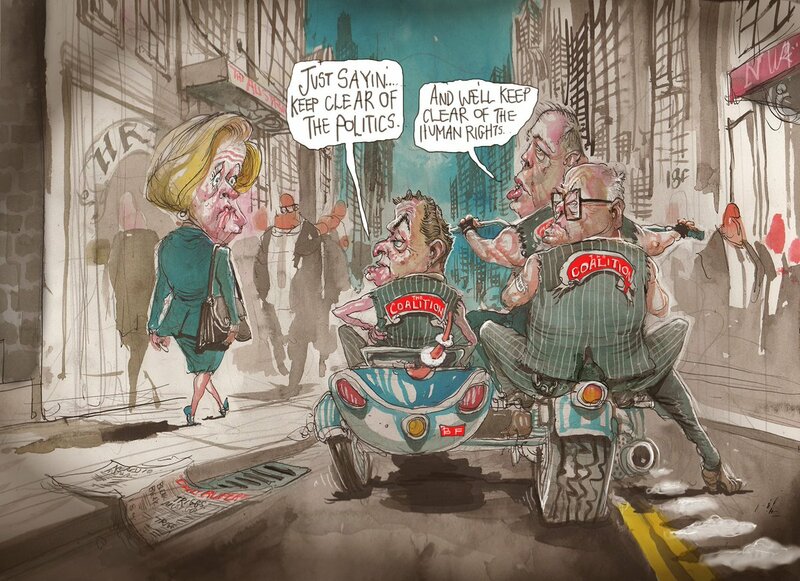 However, they can still go after Gillian Triggs and deprived of other targets, they’ll no doubt double their efforts. Obviously, the solution for the government is to cease persecuting refugees. The pursuit of Professor Triggs is a distraction: don’t look at the refugees, look at this woman who is (allegedly) overstepping her role. It’s a greater offence to (allegedly) overstep a role than it is to torture refugees. Again, we see the classic abuser spin: it is a far worse crime to speak out about abuse than it is to perpetrate it. It’s been messenger season as long as I can remember, in private and in public life. The paradigm is deeply entrenched in our society. It starts at the top and it doesn’t trickle down, it roars like a river in flood. It’s time to turn it around and put the focus where it belongs: on the perpetrator. In this case, the Turnbull government. Stand with the messengers. 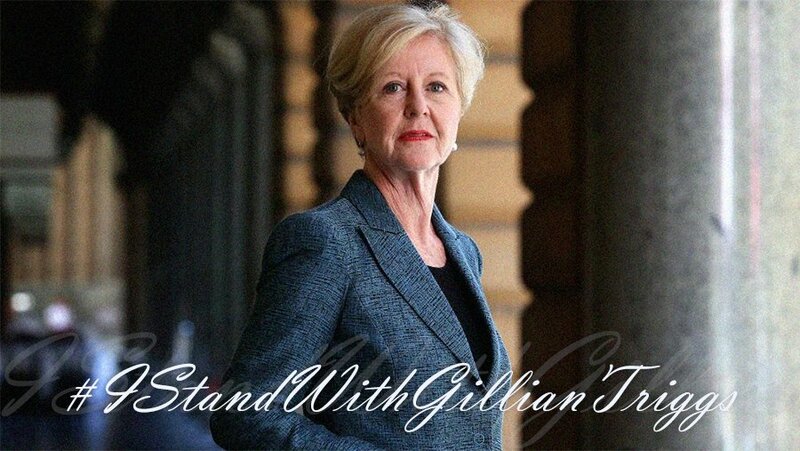 Stand with Gillian Triggs.